Quite short, which isn't much of a problem. I would excpecting more 'Katamari Damacy' for the music. I didn't want to go too close to the original game. It's one thing to make a game inspired by a web comic that's licensed under creative commons. It's a whole other one to tread too close to Nintendo intellectual property. 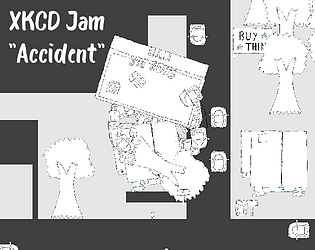 That said, the main melody is what happened when I hummed the Katamari theme song and tried to match it visually. Obviously, the result is nothing like it, but it sorta works as a tune regardless. People who haven't played/aren't aware of Katamari Damacy will likely be very confused about this game; it'll take a bit for them to understand what they need to do. If I didn't know about Katamari Damacy, I probably would've driven around for a while, confused and frustrated as I run into cars and hear a bad noise, until I happen to hit a small object which attaches to my car; after that, I might start to understand, or I might think I did something wrong. The description is pretty vague, too, and doesn't really help a clueless player; you might want to edit the description or add a screen at the beginning of the game. Those who have played/heard of Katamari Damacy will likely find this game easy, but fun, like I did. It's a charming little game. The music track is pretty well chosen, though it does run the risk of becoming grating after a few loops. The sound effects are very simple and more of them would be nice (cars honk when you collect them, sound of trees uprooting when you collect them, etc). I don't understand why the game said "You're a star" at the end. Is this a reference to Katamari Damacy,? I haven't played it, I've only heard of it, so I don't know. That's an excellent point on the instructions. Will update those when I can. I'd say hoped the people right at the start would dart into the road and demonstrate quickly, but no guarantees there. Definitely could have used some more sound effects. A lot of the fun of the original was the sounds of wanton destruction. I just kinda ran out of time. The star reference is absolutely a reference to Katamari, but hopefully it feels fine even if you don't pick up on it. In the game, your dad/the king of the cosmos gets drunk and breaks all the stars. So you're tasked with rolling up objects to make new stars. When you succeed, the king of your ball to the sky as a new star. The original had you on a timer, but also with better level design and just bigger levels in general. They had you relatively boxed in until you reached a certain size, than you could break through to new areas. I wanted to do similar with this, but it wasn't really feasible with the setting I'd chosen. Because of the comic, you start at size "car", and the biggest things I could think of were trees and buildings. Would be fun to do some more experimenting with the concept. Not a very challenging game, but delightful! I had a good time with this, thanks! Nice take on katamari. Needs some animation of the rolling ball to give it a feel of a ball, as of now it feels more like a clump of magnets sticking together. Well done for working on all the assets on your own! I wasn't really sure how to make the ball roll from a to down perspective. Something to think about though. Yeah, the game could probably use some clearer instructions. Glad you enjoyed it though! Pretty nice! Fun is kinda immediate, and it has the right amount of absurd.